The new Music Angel Friendz is a compact stereo loudspeaker with a built in digital amplifier and rechargeable battery with over 120 hours of playback time. Finished in aluminium, the Music Angel Friendz comes in a choice of seven stylish colours and sound quality that belies its compact size. Available in-store now from Waitrose or on-line from mobilefun.co.uk and Amazon, Music Angel Friendz has a UK SRP of £24.99 each. Made of sturdy aluminium with high quality components. Back-to-back full range drive units for excellent, clear sound quality. The playback time is up to 120 hours on one charge, which is unmatched on the market! 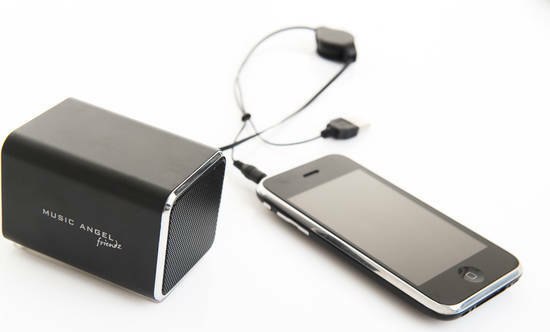 The speaker can be charged from PC / MAC and any standard USB charger. Charge time is 1-3 hours. The soft feet lets you place it on any surface (including your device) without scratching. Daisy chaining multiple speakers gives increased volume. Available in black, blue, silver, green, pink, orange and red. The Music Angel Friendz gives users the freedom to listen and share their favourite stored music, on-line radio, podcasts, video and games anywhere anytime and can even be used to Skype. Compatible with all smart phones, tablets and laptops, the Music Angel Friendz audio connection is via its 3.5mm stereo headphone socket. For charging, users can connect via its mini-USB socket to any PC / MAC and all standard USB chargers, where a single charge of three hours will give 120 hours of playback. For higher volume levels, Music Angel Friendz can be daisy-chained together using the supplied cables and soft feet positioned on the underside allows the user to place the speaker on any surface without causing damage. The Music Angel Friendz comes supplied with all necessary cables and a small carrying pouch to protect the unit in transit. Available in-store now from Waitrose or on-line from mobilefun.co.uk and Amazon, Music Angel Friendz has a UK SRP of £24.99 each. Music Angel Friendz is the brain-child of Baard Johannessen, a Norwegian biologist who came up with the idea of Music Angel Friendz whilst travelling and wanting to have a miniature speaker that could be used either on its own or as part of a set. Formed in 2011, Music Angel Friendz has already shipped over 300,000 units across Europe and is distributed in the UK by Frequency Telecom.